A decade ago, most of us thought of essential oils as expensive perfumes. Now, however, I as well as millions of people are using these oils for a variety of medical purposes. What is lavender? How can it help you be healthier and happier? Here is what I've learned about this beautiful purple flower. This article will all of the benefits and uses of lavender oil and provide you with recipes that you can try to incorporate into your daily regimen. What Company Should I Purchase Lavender Oil From? Many of us recognize the familiar floral scent of lavender. Lavender is more scientifically known as Lavandula angustifolia, L. vera, or L. officinalis. There are also subspecies with individual health effects. Lavender is a hardy plant that grows well in rocky areas and at high altitudes, most notably in the Provence region of France. As a result, it was popular as an herb and a remedy in bygone times, because it was readily available and even grew as a weed in many otherwise harsh settings. It also was used as a spice in many traditional dishes throughout Europe. Although lavender is both beautiful and fragrant, it also has been used as medicine in many cultures throughout history. Modern people are just beginning to discover how this herb can make us healthier and happier. Although we all recognize the plant and its smell, there are several different kinds of lavender. L. stoechas is the kind of lavender that many of us recognize from French cooking. Bred in the highest altitudes of the Provincial alps, this kind of lavender is considered the holy grail of French regional cooking. The most common form of medicinal lavender is L. angustifolia. This in turn has two subspecies, L. fragrans and L. delphinensis. These should not be confused with their closely related impostor, spike lavender. Spike lavender comes in the species L. latifolia and L. intermedia, both of which are used in lavandin (not lavender) essential oil. Lavandin has many of the same medicinal effects and a similar smell to true lavender. However, it is important not to confuse the two and to know exactly which plant you are buying. If you live in most areas of the world, you are probably more familiar with common lavender. This species used to live only in mountainous regions of the Mediterranean world. Now, however, it is a common addition to gardens and yards in many regions. Common lavender is a bushy plant with spike-shaped green-gray leaves that end in lavender colored blossoms. These plants produce a volatile essential oil that gives them their distinctive scent as well as their medicinal properties. They grow throughout the world, on almost every continent. The word "lavender" comes from the Latin word "lavera," which means to wash. This plant was often used to add scent to Roman baths. Many ancient cultures used lavender as a perfume. In addition, it was used in Egyptian burial rites, to help preserve bodies and reduce their smell. Lavender was used with similar purposes in Europe in medieval and Renaissance times. People used it during the plague both to cover the smell and as a disinfectant. This oil-filled plant also has had other uses throughout history. It has been used as an air freshener, providing a non-toxic version of modern wax cubes and plug-ins. In addition, lavender essential oil has been used to relieve stress, as just a whiff of this classic scent makes many people feel calmer. Lavender also was used as a headache remedy. People have combined this essential oil with either mint or chamomile and rubbed it on their temples to relieve the misery of headaches and migraines. In addition, lavender essential oil has been used as a remedy for muscle aches. People rub this oil directly on the joints or muscles that are causing them pain to get relief. Last, lavender has been used for wounds, burns, and other injuries throughout history. It appears to have properties that help epithelial cells to heal more quickly from injury. In addition, lavender was believed to prevent infections in ancient times. Ancient civilizations used herbs because they did not have access to modern medications. However, it appears that many of their remedies were just as effective as our own, without the side effects and risks that we have come to accept as normal. Many modern people are turning to essential oils for medical purposes. So, how is lavender being used as a medicine in modern times? The wide variety of answers surprised me. Lavender is not just an ancient remedy. People in the modern world, including me, are using this plant and its essential oils for a variety of purposes. These are just a few of the ways that people are using this sweet smelling flower and its oils in their own homes. The scent of lavender is used commonly to relieve anxiety and the resulting insomnia. There are a variety of different recipes for this purpose. Place five drops of essential oil in a small bottle of water to make an all-natural linen spray or air freshener. Place a few drops on your wrists and inhale deeply when stressed. Add 2-4 drops to your favorite body lotion before use. Use sachets of dried lavender in your pajama drawer to enjoy nightly aromatherapy. In addition, many people take lavender as a tea for its relaxing effects and smell. There are several commercial teas intended for sleep that are sold in health sections of stores. I personally enjoy a cup of tea made with fresh organic lavender and chamomile when I need to calm down before bed. Lavender is still used to relieve muscle pain, joint soreness, and similar musculoskeletal pain as it was long ago. People generally use one of the following strategies to enjoy the pain-relieving properties of this herb. Add a few (2-4) drops to the carrier oil of your choice and massage it into the painful area. Make a poultice by soaking fresh or dried lavender in hot water. Soak a small towel in this and apply it. As with all essential oils, use caution when applying lavender to broken skin or areas with a rash. Lavender was once used as a disinfectant during Plague epidemics. While we no longer have that concern, antibiotic-resistant bacteria are major concern. Household use of commercial antimicrobial products are a major source of this growing resistance. Natural disinfectants are a responsible way to keep a sanitary and pleasantly-scented home. Clean germy areas with several drops of lavender oil mixed in a bottle of warm soapy water. Add 2-4 drops to a carrier oil such as coconut oil and apply to acne, burns, and other wounds that can benefit from gentle disinfecting. Care should be used in applying any essential oils to injured or broken skin. Apply a small amount to a corner of the wound first to ensure that the oil does not irritate your skin. 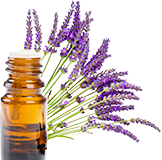 As with all essential oils, lavender should be diluted in a carrier oil such as coconut oil before being applied directly to a wound, rash, or acne. Many commercial insect repellents contain DEET and other toxic substances. Who wants that kind of poison on their skin? Instead, I use lavender essential oil as an insect repellent. As a bonus, it makes me smell sweet instead of like a chemical factory. Place a drop on your wrists and at the back of your neck when in areas with biting insects. Make a repellent spray by dropping 5-6 drops of lavender essential oil into a spray bottle of water. Shake before spraying. Add a few drops of lavender essential oil to your favorite candle and use while camping or barbecuing to keep the bugs away. While humans love the smell of lavender, creepy-crawlies do not! Use this to your advantage whenever you are worried about mosquitoes, ticks, and other biting bugs. Many of us spend a lot of money on scents - whether perfumes, air fresheners, or scented waxes. Many of these smells have not been tested for safety with regular use. In addition, many people are sensitive or allergic to artificial scents. Lavender is an all-natural way to keep your home or yourself sweet-smelling without filling the air with chemicals. Add a few drops to your bath and enjoy a long soak. Apply a drop to your wrists or neck. Use it sparingly as any scents can be overwhelming when over-used. Add dried lavender in sachets to drawers, closets, and other areas of the home that tend to get a musty smell. Add 2-4 drops to a spray bottle of water and use it as an air-freshener. Lavender essential oil can also be combined with other essential oils to create your own signature scent, whether as a perfume or for your home. Lavender has a variety of medical uses, as do many essential oils. However, you do not have to take my word for it. There are several studies that have backed up the historical and modern uses of this flower and its essential oils. What are the healing properties of lavender essential oil? A study in 2015 found that lavender has properties that make it a powerful anti-inflammatory, antioxidant, and analgesic (which means a pain reliever). Many people use lavender oil as a home remedy for headaches and migraines, especially combined in a 1:1 ratio with peppermint oil. Several studies have been performed looking at lavender as a treatment for anxiety. In one study, patients who took capsules containing lavender extract. However, you do not have to eat lavender oil to feel relief of anxiety. When I am feeling stressed out, I use the essential oil as aromatherapy. This also is an evidence-based usage according to several studies. Spraying lavender on bed linens is a common remedy for insomnia and other sleep disorders. One study found that sleep quality improves when people take ten deep breaths of lavender before bed and then sleep with the diffuser next to their bed. Many women, including me, use diluted lavender essential oil as a topical treatment for scrapes, burns, and other minor "owies." The skin benefits of lavender also extend to people who have acne and other common skin disorders. Studies have found that it reduces the redness and size of pimples, likely due to its antioxidant properties. We are still learning more every day about how essential oils and natural herbs can be used safely as a treatment for many of the health issues that plague us. Although you should always talk to your physician before trying new treatments, lavender has definitely become part of my personal plant-based medicine cabinet. All substances, even the most natural and gentle, can occasionally have side effects. Lavender is no exception. Some people are allergic to lavender, the same way some people are allergic to pollen or ragweed. These people may have cough, sneezing, runny eyes, and other allergic symptoms when exposed to the plant. A small number of these people may get rashes or irritation from exposure to the essential oil, even when it is appropriately used and diluted in a carrier oil. In addition, some people have sensitive skin that is irritated by essential oils. These people will notice irritation when using oils. In many cases, dilution with a non-irritating carrier oil can resolve this issue. In order to determine if you have an allergy or sensitivity to lavender oil, you should test it before use. Put 2-4 drops in the carrier oil of your choice and rub a single drop of this on your arm or other area with unbroken skin. If you develop redness or itching, wash the oil off and discontinue topical use immediately. A small number of people are sensitive to even the smell of lavender. These people may notice headaches, watery eyes, nausea, and other symptoms when they are in a room where lavender products have been used. Extreme care should be used when taking lavender essential oil orally. Most oils are not regulated or approved for oral use. Lavender is a powerful relaxant, so it should not be used with other sedative medications. Avoid using it with alcohol as well. However, using fresh lavender in a tea is fine as long as the tea is sold for oral consumption. Is lavender toxic to Humans? Lavender essential oil can be toxic both to humans and pets when it is consumed in large quantities. Symptoms of this toxicity include abdominal pain, nausea and vomiting, diarrhea, consuming lavender oil can be toxic. Signs of lavender oil toxicity include abdominal pain, blurred vision, burning in the mouth and throat, vomiting, diarrhea, rash, and difficulty breathing. Call poison control for instructions if your children or pets accidentally ingest any significant amount of this oil. All bio-active substances can have effects when used improperly or in large amounts, even natural ones. However, most people do not have any negative effects from using lavender as a home remedy in the recipes I have described here. I have never had side effects despite using both herbal lavender and lavender essential oil in a variety of ways. Can lavender oil make you sick? Studies have shown that it has the possibilities of causing breast growth in boys if overused in high amounts and without proper dilution. Essential oils have become a health craze. How are these products made? The answer is more complicated than I suspected when I began using them. Fresh cut lavender is steamed for several hours. This causes the oils to separate from the water and plant material. The plants are steamed to gently remove liquid. The oil can then be pressed out of the remaining herbs. This oil contains all of the active compounds of the lavender plant in a concentrated form. Many people make lavender oil at home by simply soaking lavender in the oil of their choice. This can make a useful and effective oil, but it will not be as purified or concentrated as an essential oil. It is important for only organic herbs to be used in this process. The way that oil is processed and purified will also extract many common pesticides if they are present. It's important to choose high quality products from brands that you trust. I began my journey using lavender as a soothing aromatherapy for my bedroom, to relieve stress so I could get the sleep I needed. However, as I researched this plant and its essential oil, I began using it for an increasing variety of purposes. It is now one of the most used products in my medicine cabinet. In summary, lavender (both the plant and the essential oil) has been used throughout history both safely and effectively for a wide range of purposes. Although many people have forgotten these old remedies, many of us are trying to live purposefully in these ancient, natural ways. Research backs up many different uses of lavender and shows that side effects are usually rare and mild. It performs as well as pharmaceutical medications that have far greater risks. This beautiful flower can be an effective home remedy for many of the most common minor injuries and illnesses that we encounter. I hope you enjoyed learning about all of the cool benefits and uses that lavender essential oil offers. It is definitely one of the most versatile oils because it can be used to create so many different types of blends to solve your everyday problems.